Margie's Crafts: Mini Treat Bag using Stampin' Up! 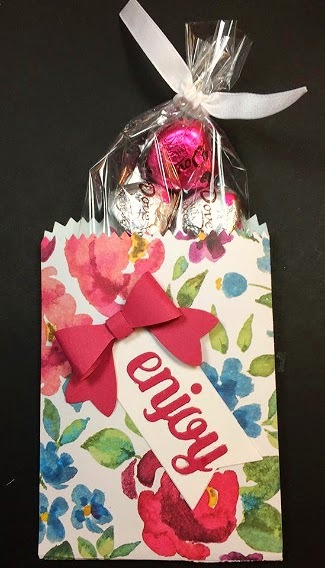 Mini Treat Bag using Stampin' Up! I love little handmade gifts that you can give your loved ones. It shows that you put extra effort and thought into the gift. Here is a simple, yet impressive treat bag that you can make and fill with a few chocolates, bath salts, coffee beans, and the list can go on and on. Run DSP thru Big Shot using the Mini Treat Bag Thinlits. Run Rose Red card stock through Big Shot using the Enjoy from the Mini Treat Bag Thinlits set. 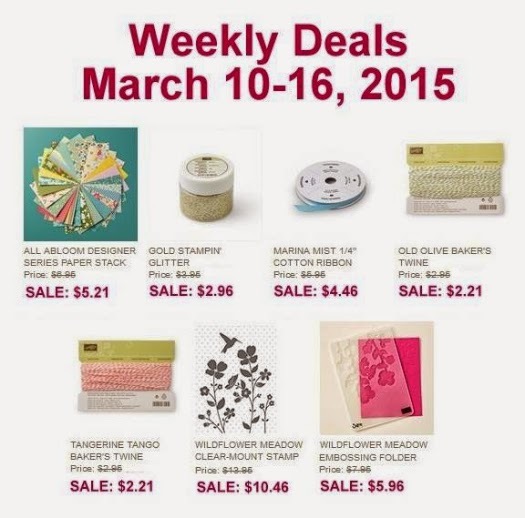 Run Whisper White card stock using the banner from Mini Treat Bag Thinlits set. Punch out two of the bows using the Rose Red card stock scrap. Assemble the bow using glue dots. Assemble the treat bag using snail adhesive. Attach the Whisper White banner using snail adhesive to the front of your bag. Attach the bow to the White banner using glue dots. Fill cello bag with treats and tie with ribbon.